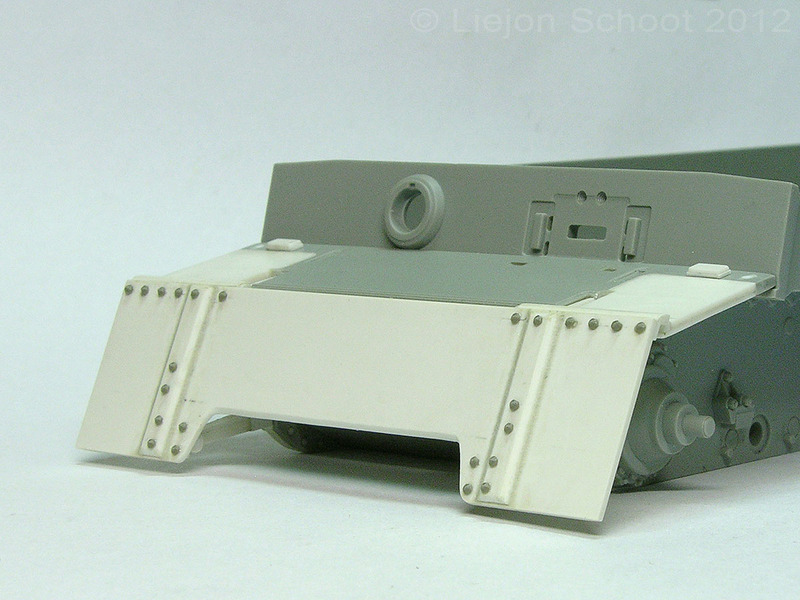 Vorpanzer study, visualised by Liejon's 1/35 model. During an early Tiger study, Liejon Schoot encountered remains of the Vorpanzer. It's working was not clear. 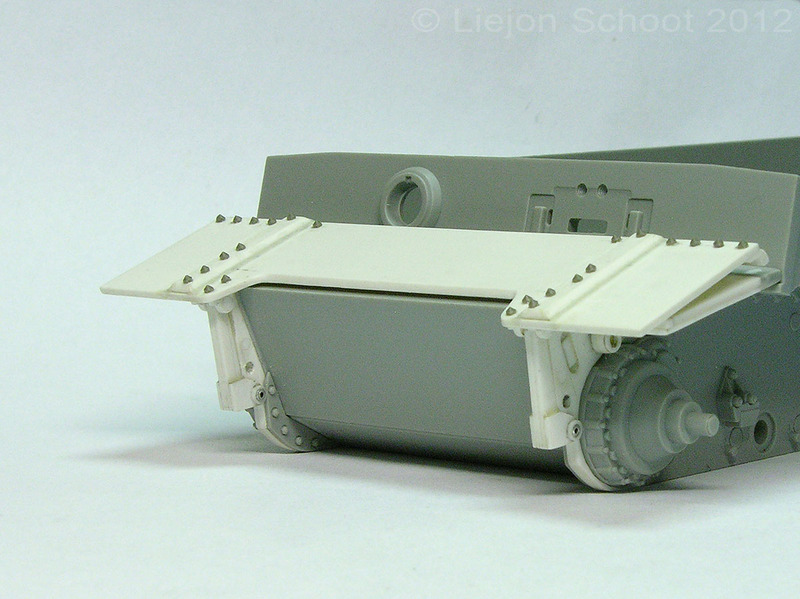 This resulted in him building a model of a prototype VK 45.01(H), specifically chassis V1. The Vorpanzer was an extra armour plate that was carried on the Tiger's glacis plate. When going into battle, this plate could be lowered for extra protection. The first prototype and one shooting range test target vehicle were equipped with it. Obviously, it did not meet criteria since it was immediately rejected. 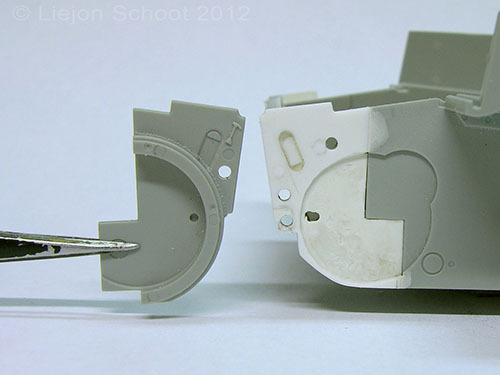 On early production Tigers, remains of the Vorpanzer design can still be found. Liejon can be contacted here: liejon (remove this and join) (at) panzerbasics (dot) com. Regarding the Vorpanzer there is not much data available. The table below mentions data sources for the pictures we used during our research. Higher quality of these pictures will not be provided here. Note that the Vorpanzer already seems deleted, though the glacis extensions are still there. 1) The cut-out at the top has straight edges. It's not circular. 3) Plugged towing hole - It was used on V1. 4) Unknown plugged hole. Possibly this was used for positioning the new circular armour for the final drive. 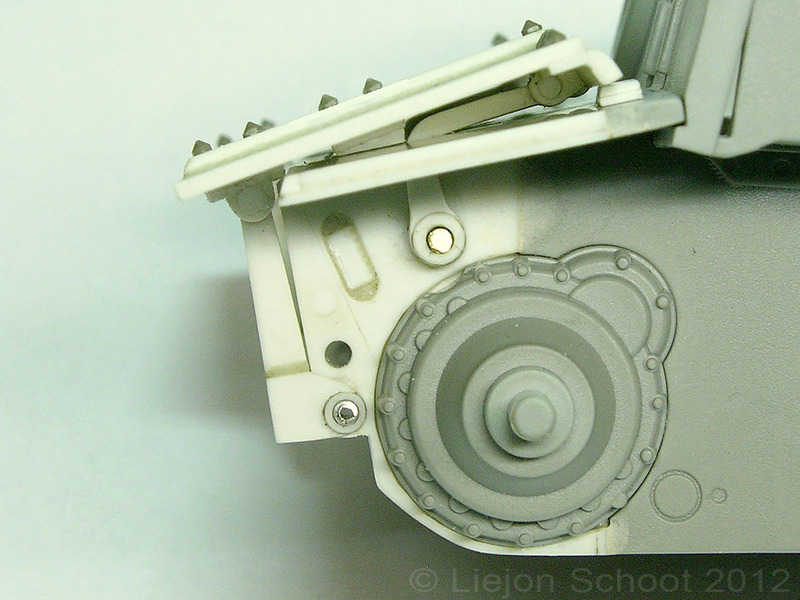 5) This stopper edge for the lower Vorpanzer arm is clearly placed at a different angle as the lower side plate's front. If my drawing below is correct, it's at 7° from vertical. I (Rob) started with a sketch that was continuously updated to the drawing on the left. Things proved to be far more complex then thought at first sight. This because altering just one dimension in the mechanics meant reconstructing the lot. There are only a few known dimensions to work from, the rest had to be obtained by logic and comparing the pictures. The resulting drawing shows a realistic Vorpanzer of which the mechanics would actually work. Please keep in mind that these dimensions may not be 100% accurate, whilst there are also small differences with Liejon's model. The model of the Vorpanzer is an as accurate as possible reproduction of the real thing. All dimensions are estimated from the few existing pictures, and made to fit a 1/35 model (Dragon 6600) By making the mechanism workable, and the shield fitting in a similar position in both raised and lowered position as in the pictures, I could determine the height of the shield, the length of the arms and position of the hinges. The front ends of the lower side plates are different from production vehicles. On the right is the front side of a prototype chassis. It has no semi circular armour to protect the final drives, the "extensions" end lower, and there are two holes drilled, one for the lower Vorpanzer arm, and the top one for fitting a towing shackle. On the left is a front end of an early production vehicle. The "extension" is cut shorter just above the hole for the lower Vorpanzer arm. 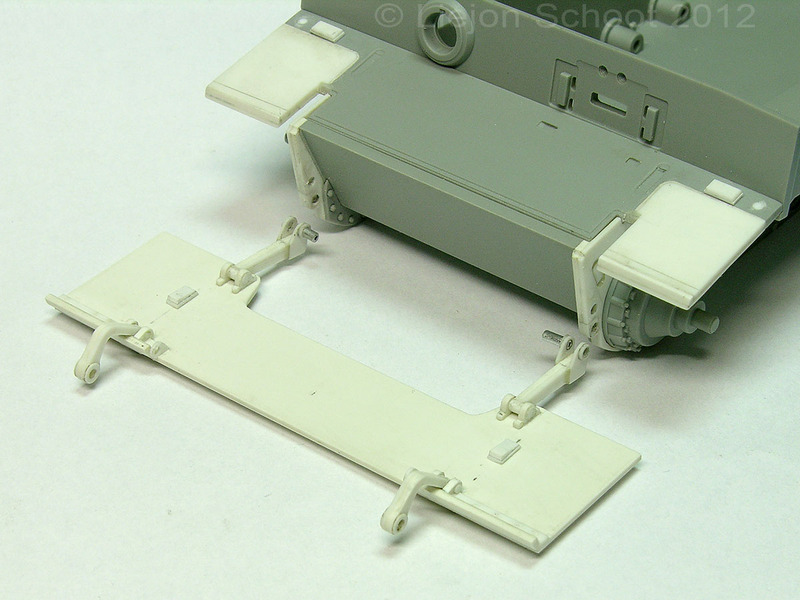 The hole for the towing shackle is plugged and relocated to a higher position because of the semi circular final drive armour which was added after the Vorpanzer was rejected. 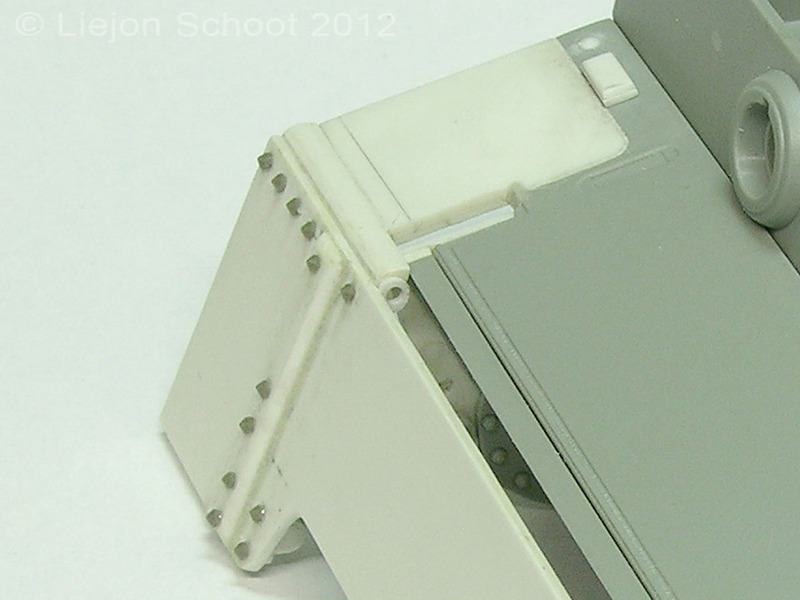 The notch in the top of the "extension" is still present on the early production chassis. Another difference with production hulls is the glacis plate. Originally the glacis plate was wider, extended over the tracks. 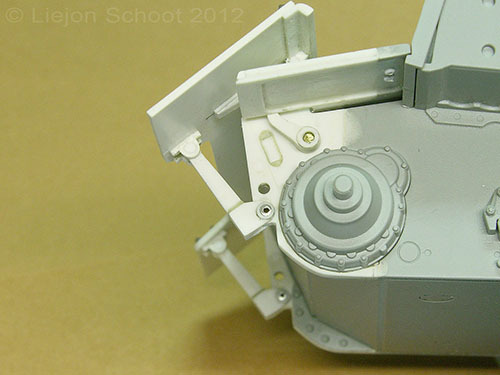 There were two cut-outs to allow the upper arms to rotate. There are a few theories about why there are holes in the corners of the glacis plate, for camo poles or a small crane. 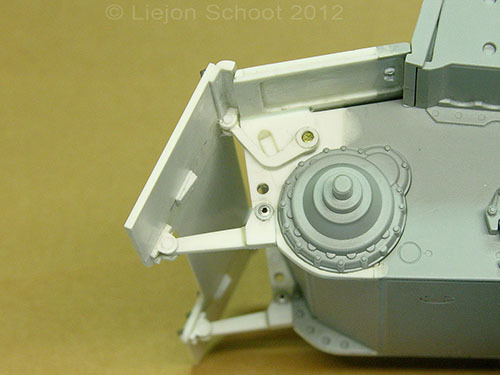 Pictures show the holes were not present yet on the prototype. My theory about the holes is as follows; When the Vorpanzer was rejected the corners of the glacis were cut from all already produced glacis plates. This possibly was done because easy access to sprockets and final drives with a crane was required. 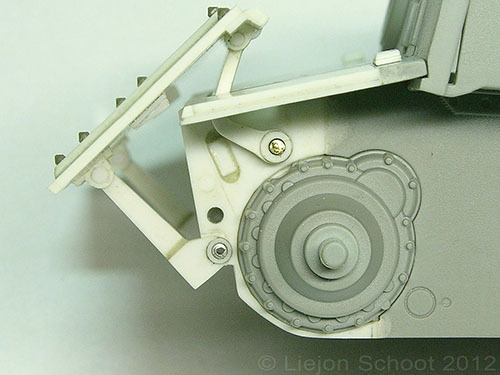 At the same time, or maybe little later, the holes for the "sprocket crane" were drilled, so the need for a motorized crane was no longer needed in the field. Rings to provide a level base for the crane were than added in Dec. 1942. This together with the fact that headlight brackets could be welded on more easily, and something which can be seen on this location in pictures of the prototype, made me realize it could be for something that needs a firm fixture on the glacis. 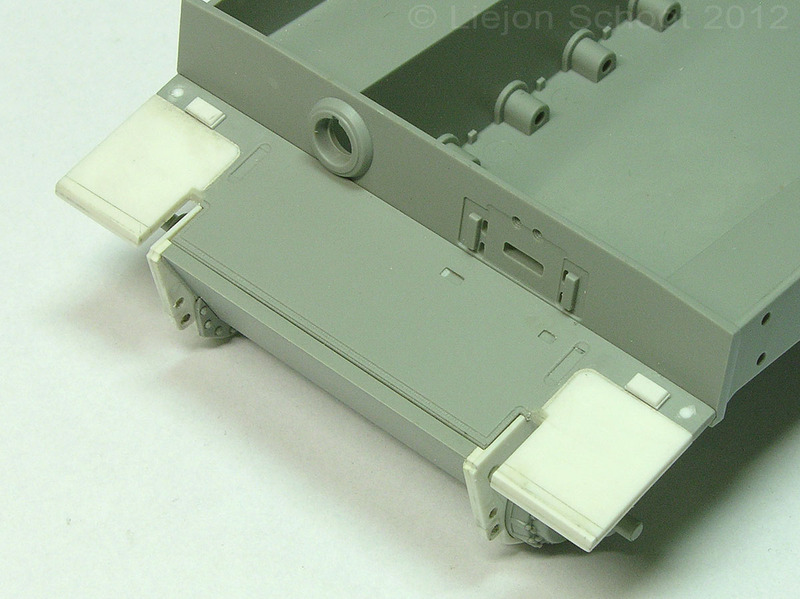 These wartime pictures show a part on which the Vorpanzer shield rests on when in transport position. Most logical would be a rubber block on a metal plate which is bolted to the glacis. The shield in the transport position. The shield rests on rubber blocks which are bolted to glacis and shield. The four rubber blocks would carry some of the plates weight and relieve the hinges in transport position, possibly they also would secure the plate against sideways movement. Note; It's not known how the hinges, that connect upper arm with the shield, looked like, or if there were rubber blocks, the model shows how it could have been, it's not fact. The shield between transport and lowered position. For a period during movement of the shield, the drivers view through the vision block will be obstructed, and the driver would need to use the K.F.F.2. twin drivers periscope. In lowered position the angled strips which are bolted to the top of the shield rest into the cut-outs of the side armour "extensions", relieving the upper arms from the weight of the shield. The lower arms are locked against the hull. On the underside, the glacis plates were recessed, possibly to have little more clearance with the tracks and prevent dirt to build up. On the APG Tiger the recess can be partially seen, unknown is how far it stretched to the front. 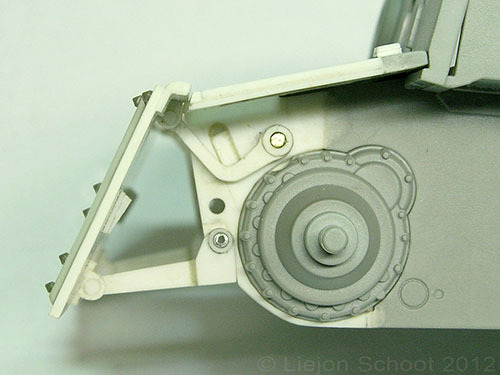 A view on how the upper arm rotates through the cut-out in the glacis plate. In lowered position the angled strips on the shield close the gap between shield and glacis. Next to the angled strips is something of which I think are lifting eyes for installing the shield to the hull. This is how the shield could have looked like on the rear. The exact shape of the hinges is not known, and the "rubber" blocks are only a theory. With the shield in this position the lifting eyes could be explained. For fitting the shield first the lower arms would be fixed to the hull, than with the aid of the lifting eyes the shield could be lifted against the hull and the upper arms fitted in place, again just a theory. During movement of the shield, and in raised and lowered position, there are only small tolerances. A bend arm or deformed shield could cause problems with operating and positioning the shield. In lowered position the shield and glacis protect the tracks against frontal hits. What effect would the lowered shield have during cross country manoeuvring, or obstacle filled terrain. The shooting range photos suggest the shield was blown of during testing, seemingly the hinges were the weakest parts. According to DW to Tiger 1, the Vorpanzer mechanism was raised and lowered by a high pressure system consisting of hydraulic cylinders, geared supports, geared segments, levers and shafts. It is unknown how this system looked inside the hull, but a possible remainder of this system still can be found on all later Tigers. Behind the radio operator and in front of the turret is a selection lever. 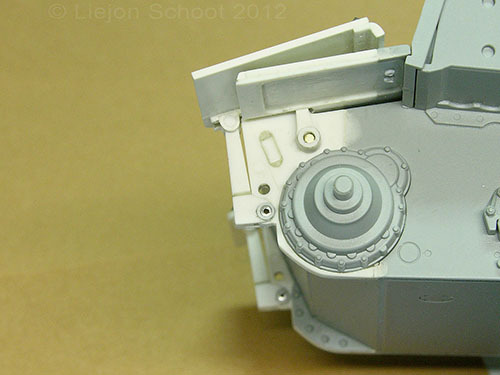 The turret PTO (Power Take Off) is powered by the vehicles transmission, and the selector shifts gears inside the PTO. The first three positions are clear, but the last position raised a question, oil pressure, for what? Not for the turret, the turret could be traversed hydraulically, but the hydraulic traverse pump was on the turret floor and mechanically driven by the PTO. The fourth position was possibly for hydraulic power to the Vorpanzer mechanism, and for the hydraulic operated cooling fan grids. An illustration shows that inside the PTO was a hydraulic pump, which possibly was removed from the PTO's on production Tigers. Bilge pump turret - Mainly used during fording operations. Still present on all production Tigers this position would possibly only select "Turret".